SocialBadge will support Espoo Day 29.8. to help visitors to find each other | Urban Mill – Building IntenCity! To connect people SocialBadge uses Bluetooth technology, that’s why distance is so small, however users could be sure that the person s/he found through app is really nearby. 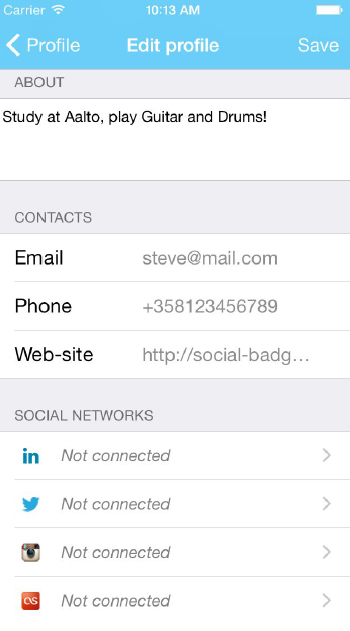 To start using SocialBadge you have to install the app ( iOS or Android ), register through the Facebook and enter your basic information. You can also connect your social media profiles from your profile page (see the screenshot). 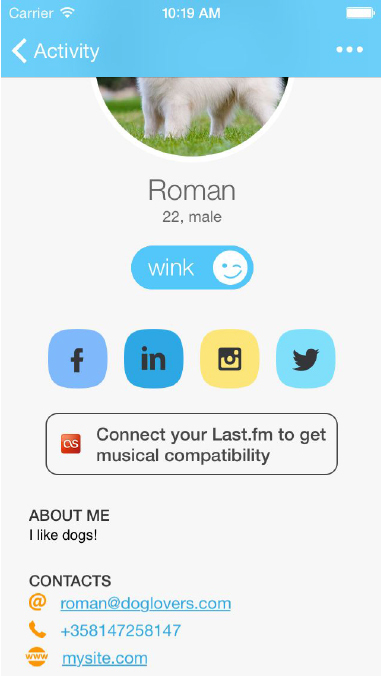 After you have done it, it’s now possible to share your profile with people nearby. Your profile consists of basic information you have entered and links to social media you have connected. By turning on/off the sliders on your profile page you choose what information you would like to share with people nearby. To discover new people around, go to Discover tab and then you will see the people who is right here and right now. You can observe their profiles and write them a message (or just wink to raise their attention) if you, for example, would like to meet right now. 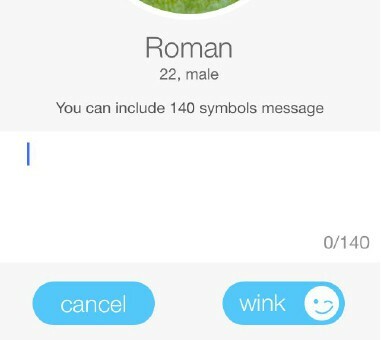 The history of your winks and messages can be found on Feed tab. The profile’s settings page: It’s being opened when you launch app for the first time. After that you can open it by pressing “Edit info” button on Profile tab. Fill in your contacts and connect networks. It is the easiest and fastest way to share your information. Your profile page: Here you can manage information you would like to share with nearby people. It is as easy as 1+1, if the switcher is on (green), the selected contact or social network will be visible for the others. 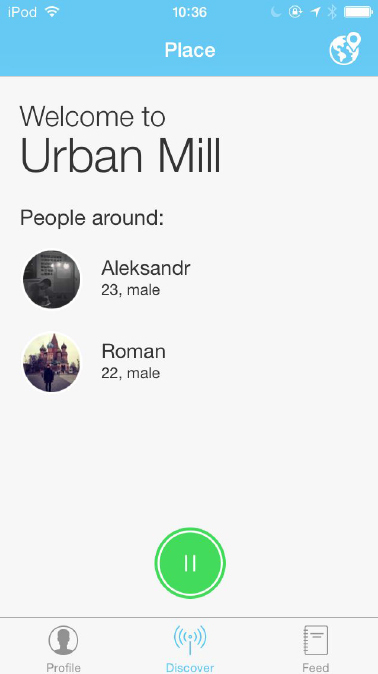 Discover tab: Here you can see who is around you. To look on someone’s profile in details, just tap on the name or photo. If you don’t want to share your profile, you can press “pause” button (green). In this state other people can’t see you, but you also can’t see them. Public profile page: Other people’s profiles will look something like that for you. When you click the buttons (Facebook, LinkedIn, Instagram or Twitter) you will be redirected to the user’profile in that social Network. Install the app and prepare your profile right now to be ready to explore new people on the Espoo Day! This entry was posted in Aalto University, ADF, City of Espoo, Design Factory, Espoo, From Espoo Innovation Garden, Helsinki, Kumppanit, Opiskelijat, Otaniemi, Tapahtumat, Urban Mill, Uutiset, Verkosto and tagged Espoo day, Espoo-päivä, SocialBadge, Startup, Students by larsmi. Bookmark the permalink.